You got here on the night of Halloween, trick and treating us all. Tricking your parents by stopping and starting in your journey, treating us all by your eventual safe arrival. So much power was in your birth, creating such pride in and for your mother, who did everything possible to deliver you safely, giving the most profound, life-changing experience to your father and, for your paternal Grandmother, an unexpected sense of making sense, of bringing things together, when you arrived on the sixth anniversary of your Grandfather's death. Now you are here, tiny and seemingly fragile, but with a voice that can fill the house and prehensile fingers and toes that can hold on for dear life. I was privileged to be near you in your first week, witnessing the joy and love and anxiety and utter exhaustion; the package that comes with every new baby. Already you are teaching us things you like, things you don't like. You are uncurling from your scrunched-up warm darkness, feeling air and strange movements, hearing noises that have been muffled but are suddenly sharp and clear, opening your eyes and seeing.... seeing what? Shape, light and darkness certainly, for you are looking carefully at a black and white picture your mother has placed in your crib. It's a stegosaurus. You'll know more in a few years, but at the moment it's something eye-catching. On your seventh day I saw you were suddenly transfixed by a large plant silhouetted in the bathroom window. 'What? What is THAT?' you seemed to think as you turned to look again. I told you it was a house-plant, and I'll explain more fully another time, but within a few more days you will know it's there and look for it again. You will know that the house-plant may prelude a warm bath, in which you can unfurl like one of those Japanese paper flowers when dropped into water. You know a great deal already. You know you like food and warmth and being held close, especially in your sling where you can be jiggled about and swayed just like in the old days. You like movement of all sorts, in the car, in someone's arms. Rocking and patting are good things, ensuring that you are the centre of your universe, as is your right - at least for some time more. You know that you can get the good things started again by having a bit of a shout. People will do what you want when you shout. It won't always be this way, so make the most of it. What you cannot know yet is how fortunate you are, to be born into a life where you are so appreciated, so loved, and, above all, to have such wonderful parents. If only all new-borns could have such advantages the world would be a happier, better, safer place. Enjoy it all, Little One, but try to get a bit more sleep! Congratulations to you all! Beautifully written post which resonates with those of us who have ever had a baby especially the last bit about getting more sleep (my child was nearly 4 before sleeping through the night was a regular occurence but don't tell the new parents that!) 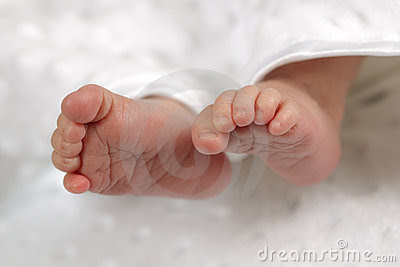 Those tiny toes like a row of little peas were what amazed me and the strength in the little hands. Babies can help us to make sense of life and I loved the fact that her birthday is the anniversary of your husband's death - one generation passes and another begins it's what Life is all about! Enjoy your grandchild they grow so fast. Oh yes, what a wonderful post. Lucky, lucky little girl. Lucky all of you! Marigold: I wont tell the new parents about the possible duration of sleep problems, but if he puts his mind to it the baby's father may remember getting up for a midnight go at the Lego when he was about 7! Mouse: thank you so much - that's a lovely comment. Joan: thank you very much for reading and commenting. Such lovely, long feet, that will no doubt roam the globe in good time. Such an insightful and empathic view, she's fortunate in all her kin. So glad everything seems to be well - we've been thinking of you all. Will pop round soon to get the latest news . Such a beautiful, beautiful post. Love in every carefully chosen word. Zhoen: that's quite a thought - those tiny feet trotting off anywhere, but I think the time will come all too quickly. And her kin will support her all the way. Jee: you know just what it's like! If I'm not here I'll be there. Elephant's Child: thank you so much. I comes from the heart, as you know. Congratulations! She is one lucky little girl. Such a lovely first missive to welcome her. Blessings on her new life! Wonderful news! You have written a treasure for your precious granddaughter. I can imagine her reading it many times throughout her life ----when she first learns to read; when she sets off globe trotting on those long slender feet; as she dresses on her wedding day ----but I'm racing ahead. Enjoy every day you have with her. Lucky little one to be surrounded by so much love----and to have that special bond with her grandpa! Leslee and Molly: thank you both for such kind comments. Firebird: thank you, and belated happy birthday to you. wonderful post, very touching and of course congratulations. A new baby - an ordinary, extraordinary miracle. Such a lovely letter, Relatively Retiring. It seems that this little girl will be both valued and cherished. Was it Douglas Adams who said that during the first 6 weeks one can see a baby rebooting? Congratulations to you and to her: she has chosen her grandma wisely.